Manchester United supporters saw new signing Fred make a positive start against Young Boys in the Champions League. The Brazilian moved the ball nicely in the first half before, like the rest of his team, becoming ineffective as Man United lost their nerve. He was replaced by Paul Pogba, who brought new intensity to United’s play and helped to lay the platform for an injury time winner from Marouane Fellaini, who now has the same amount of European goals as Diego Maradona. 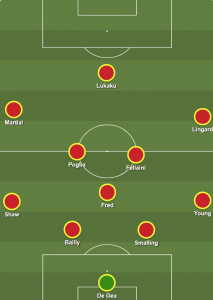 With all of that in mind, here is how Mourinho should set up his midfield for this weekend’s visit to Southampton. Surely Nemanja Matic, who looks miserably out of sorts, will be sacrificed sooner rather than later, paving the way for more fluid midfield incorporating both Pogba’s explosiveness and Fred’s technical control at close quarters, with Fellaini, in turn, providing the muscle and grit. Matic is supposedly there to keep a lid on games at the base of midfield but the opposite is happening this season: his circulation of the ball is painfully slow and attacking midfielders are getting past him with ease. There simply must come a time when Mourinho must try something different with his midfield options.